Today (actually yesterday when I started this post) is the 260th anniversary of the Battle of Gross Jagersdorf, fought in East Prussia between a small Prussian army and the invading Russian behemoth. I have played this battle a couple of times back in 2015 but using Black Powder, and this time we were going to use Honours of War. I won't launch into a history lesson but clicking on the link below will take you to an excellent account of the battle. I don't have an 'L' shaped table so chose to ignore the fighting shown here in the bottom right corner of the map below Uszbundzen. Sadly, probably the best troops available to the Russians were in this division but they didn't rejoin the main battle as they were prevented from doing so by a much smaller force of Prussian cavalry. The layers diced for sides and Conrad and Paul T ended up with the Russians while Dave and Paul S took the Prussians. To reflect the aggressive tactics used on the day I made most of the Prussian commanders 'Dashing' and the dawdling and slow to respond Russians (the Russian CinC and one of his generals) were 'Dithering'. All line and grenadier battalions have battalion guns attached. The 'secret howitzers' were apparently not terribly effective so were only allowed to fire cannister. All cavalry are inferior due to their poor mounts. All battalions with the exception of the grenadiers have battalion guns attached and all grenadier and line battalions are ‘superior’. Garrison battalions are ‘inferior’ and all the cavalry are ‘standard’. I only have one actual Prussian Garrison battalion in my collection so I roped in two other slightly out of the ordinary Prussian battalions in my collection to bring the army up to complement, the East Prussian Land Battalion and the Pomeranian Mixed Recruit Battalion von Tettau (a real unit, honest!). The Russian players during the pre-battle planning phase. I think Conrad is pointing at Apraxin and asking if there is any way he can be killed! Turn 1: The Russians were on a minus 1 for initiative and the Prussians, as the attackers, on a plus 2. Amazingly the Russians won the initiative and got to move first! Not a good sign for the Prussians....... However, all the Russian commands FAILED their activation rolls and remained rooted to the spot! Prussian Paul took the Prussian left wing, an impressive sight to behold with four infantry battalions and six squadrons of horse supported by a battery of 6pdrs. In a rare moment of sobriety Apraxin or perhaps only too aware of his mortality leads the prayers before battle commenced. The troops of General Browne, cousin of the Austrian General Browne no less, are more interested in sorting themselves out to face the Prussian advance. Dave was the Prussian CinC and commanded the Prussian right, which advanced rapidly towards the Russians deploying there and to the left of the woods. 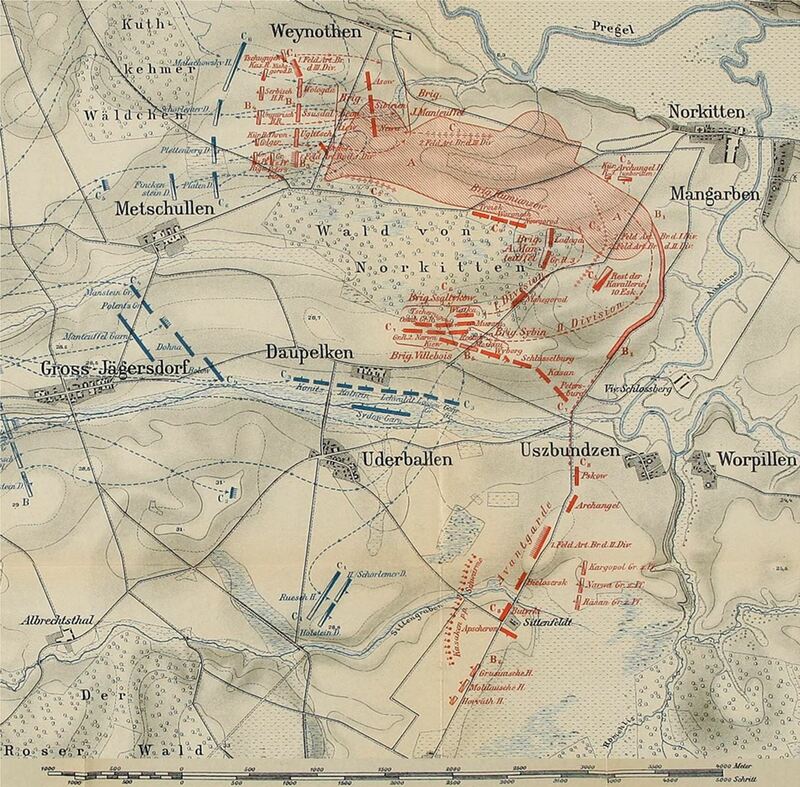 The Prussian 12pdrs started to pound the Russians but with little effect, even at close range. On Prussian Paul's flank his dragoons and hussars charged the Russians and quickly drove all three regiments back. The Russian cuirassiers and hussars were driven back towards the wood and destroyed while the Horse Grenadiers were luckier and were able to retire through the Russian camp. A battalion of Russians on their left advancing hesitantly in an attempt to flank the oncoming Prussians in the centre. Facing the Russian advance against their extreme right was a single grenadier battalion and a garrison battalion, the latter represented by the East Prussian Land Battalion. Back on the other flank, the Prussian cavalry is reforming after driving off most of the Russian cavalry. Sadly two regiments (seen in the background) were badly hit by canister after seeing off their opponents and were forced to retreat. The Russian horse grenadiers can be seen on the right just before they were forced back. The poor Prussian artillery was unfortunate to get in the way of the retreating Prussian cavalry at least twice and took a fair bit of damage before they were even in a position to deploy! The Prussians moved rapidly in the centre and engaged the Russians in the wood. 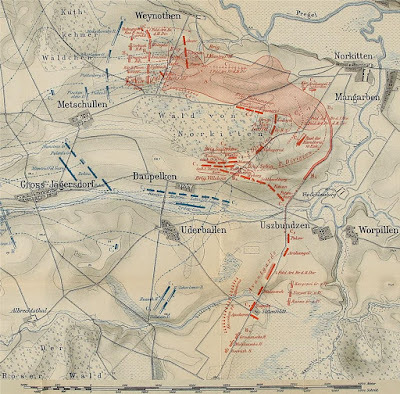 Outnumbered, the leading Prussian battalion was forced to retreat, but not without destroying a Russian battalion. Conrad kept failing his command rolls so he was unable to take advantage of superior numbers, and his reserve and all his artillery were unable to get into action. Count Fermor in command of the reserve was hit by a stray Prussian cannonball and killed. I have changed the rules regarding the replacement of commander casualties. Now, the player rolls a D6 which dictates the quality of the replacement, who could be better, the same or worse depending on the score. Fermor was a ditherer, and sadly his immediate replacement was also a ditherer! Ah well. The Russian reserve finally managed to deploy into line and began to move forward. Conrad was desperate to get his cannon into action as he was taking a pasting from the Prussian battery facing his troops. Things were hotting up even further on the Prussian left. Actually that is a slight exaggeration as Prussian Paul managed to throw 1's for his infantry brigades order for FOUR turns in a row so they were unable to advance, giving Russian Paul some time to organise his troops. However, Prussian Paul also managed to throw three successive 6's for his cavalry brigade, which as it was led by a 'dashing' commander, forced them to advance at least one move and to charge the enemy if they were within 30cm. Waves of Prussian cavalry bore down on the Russian right flank, and sheer weight of numbers finally saw the Russians crumble and their gunners were driven from their pieces. The scene at around mid-battle. The lines have yet to close on the Prussian right but in the centre the first infantry attack has been repulsed. The Prussian artillery forced several Russian battalions to retire and Count Fermor's replacement was unlucky enough to be killed! The Russians rolled to ascertain the quality of his replacement, who was classed as 'Dependable'. Things were going to get tough for the Prussians on this flank now! Russian grenadiers closing on the Prussian garrison battalion which, being inferior didn't last long and fled the field. Back on the left the Prussian dragoons hit the weakened Russian line. In the centre a Prussian garrison battalion is facing a fresh Russian grenadier battalion in the woods and will soon be forced to retreat. The second wave of Prussian cavalry hit the Russian artillery. The dragoons to the battery's front are shredded by cannister fire and the badly weakened squadron that his the battery's flank was driven off by the doughty gunners. The Prussian centre and right was being forced to give ground in the face of superior Russian numbers. The Russian guns were also by now in action and proving to be a nuisance. The Prussian CinC rallying his battered troops in the centre. Seen from behind the Russian left the Prussians are under pressure. Conrad deployed his 'secret howitzers' and started firing cannister at the Prussian battery and a battalion of infantry lurking at the edge of the wood. Dave tried to assault the Russian guns with this battalion but it was destroyed and the battery was forced to retreat, taking their guns with them. Behind the Russian centre their lone remaining mounted unit was trying to move over to the left, while battalions which had earlier been ejected from the wood were in the process of rallying. The victorious Prussian cavalry had recovered from their succession of charges and were again reformed and ready to 'go again' if necessary. In what turned out to be the penultimate turn Prussian Paul threw another 1 for his infantry meaning they were unable to close with the crumbling Russian line. The following turn they were able to advance and the fate of the Russians on this flank was sealed. On the other flank Dave was withdrawing in front of the advancing Russians. One gun was lost but otherwise the Prussians were only giving up ground and buying time for Prussian Paul to finish off the Russians on the other flank. At this point we stopped, as we had been playing (with a short lunch break) since 11:00 and it was well past 4:00. I lost count of the number of turns we played but it was well into the 'teens'. The Prussians had managed to break more Russian units than they had lost themselves so their main victory condition had been achieved and were judged to be the winners although they would have probably been forced to withdraw from the field screened by their cavalry as they were still outnumbered and somewhat battered facing several fresh Russian battalions. However, as happened after the original battle, Appraxin failed to follow up the Prussians and his army retreated into Poland. The invasion of East Prussian was over for the moment at least. This was an excellent game. I thought it would have been over one way or another much earlier but I was wrong. The outcome of game was in doubt right up until the penultimate turn, and at one point (around lunchtime I think) it looked like the Prussians would be forced to retire. Units on both sides fought like lions, and even the hopeless Russian cavalry did their part in blunting the first Prussian attack. The superior quality of the Prussian generals and most of their infantry certainly made the difference and they were able to retire and rally before re-entering the battle. Thanks to the guys for coming up for the game. It looks as if your scenario nearly matched the historical outcome, save for declaring the Prussians the winner. Maybe a small tweak in the rules: make it easier for a unit or command to get moving again after a certain number of consecutive "1s" - I hate it when players have to sit around and have nothing to do during a game. I forget how the initiative die rolling works (is it just a "1" that freezes the unit place? ), but consider adding a modifier after two consecutive turns of standing in place? All in all, a good game report that really conveys the changing momentum throughout the game. actually the Prussian could have used their CinC to try and nullify the 1s but they forgot. Von Lehwalt, being dashing, ought to have ridden over to his dependable Prussian subordinate and "offered" some encouragement of the +1 variety! Nice AAR. Prussians versus Russians should be a challenge for both sides and it sounds like it was. Overall do you prefer HoW, BP or other rules? I am gaming SYW French vs British/Allied. Thanks Peter. On balance I much prefer HoW now, despite being a great fan of BP in days gone by. I still use BP but the mechanisms in HoW work well and require a little more thought than when playing with BP. Great looking game and lovely AAR. We too randomly roll for replacements rather than them being the same; it adds a nice touch to the game. Terrific looking game as always. Glad it all came together for you. As ever a terrific looking game and a fine AAR. More! Great looking game Colin and a battle I have always wanted to play as well. As always a great pleasure to see you enjoying the rules Colin. Fritz's idea is of course a good one if one wishes to avoid too much frustration in the game - the same might be appiled to a run of 6s. Of course, there is no need for an actual rule - when that 3rd or 4th '1' occurs, a friendly "oh, give that a re-roll old boy" is very suitable. But wargamers always like to have things Written In The Rules, it seems. I am really no exception. The rules are great. I don't have a problem with lots of successive 1s or 6s. Nor am I that bothered about the canister range as in many games it's not made the slightest difference. When I'm bathtubbimg games I tend to try for 1:3 for infantry, one 12 figure cav u it for every 5 sands and 1:10 for guns. I can't help it if Freddie Boy massed his artillery ( or the Everyone else in 'the East' on occasion).